Take a stylish adventure. 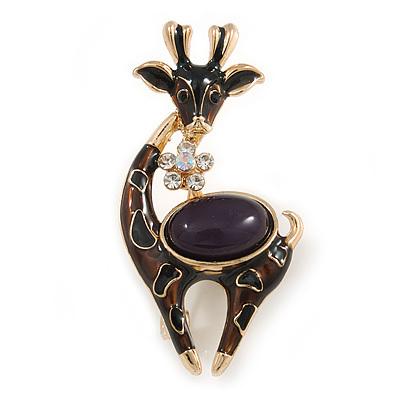 Inspired by a safari, this stunning brooch showcases the majestic beauty of Africa. Its spotted design speaks to the timeless look of animal print fashions. The brooch crafted in gold tone metal and decorated with dark brown and black enamel detailing. The body accented with a black oval resin stone and a clear crystal flower. It measures about: 48mm Tall, 25mm Wide. Secures with a flag and revolver fastener.